The Garmin Vivoactive HR is the company's second stab at a big all-rounder sports-focussed smartwatch. Across Garmin's huge range of specialist sports wearables, the Vivoactive HR is the only watch designed to do it all, and bring all those disparate modes together in one fitness watch. Running, cycling, golf, swimming, fitness tracking, smartwatch notifications and heart rate: they're all here. Not to mention cross country skiing, indoor cycling, indoor running, indoor rowing and more. The Vivoactive HR is a Forerunner, Swim, Approach, Fenix and Edge all in one watch, at least to a certain degree. It's the unashamed jack-of-all-trades for the weekend warrior. The kind of person who goes on a morning run, hacks 18 holes on the golf course in the afternoon and takes a Sunday walk with the family. But is Garmin's new everyday sports watch the perfect watch for you? We've put the Vivoactive HR to the test to find out what it can really do. Our biggest issue with the first Vivoactive was the design – it was possibly the dullest, least stylish black square ever created. It's dated badly too, and the design actually makes us feel a little queasy in retrospect. The new Vivoactive HR's design is at least more normal – but it's still a hunk of lifeless black plastic. We just don't get the logic of why the Vivoactive has to be so… bland. It's supposed to be the ultimate, everyday watch of the people. Is it just us that refuses to be defined by this plastic obelisk? When you look a little closer, changes to the Garmin Vivoactive HR become apparent. It's pretty thick and long, housing the heart rate monitor at the rear and a fairly sizeable battery. It's also "water resistant" to 5ATM (around 50m), which always adds a bit of bulk. Garmin's recent strategy has been to sacrifice screen quality and brightness in favour of longer battery life, which goes a long way to explain the Vivoactive's lacklustre display. It's colour (just about) and features a low 205 x 148 pixel resolution. To put that in context, most smartwatches are at least 300 x 300. It's fairly hard to read, especially as the display defaults to a dull power saving mode until you interact with the watch, which will fire up the backlight. By default this is set on 3/10 and you can adjust it, although there's no real need. There's a flick gesture to switch on the backlight, which can be turned on in the settings and which works about 50% of the time – this can make the watch irritating to use in the dark. The Vicoactive HR uses a touchscreen, and you can swipe down through the daily activity and notifications menus. You get an overview of your day followed by steps, intensity minutes, last sport completed, weather report, notifications and heart rate over the last four hours including resting HR. Tapping any of these menus gives you an extra detailed view, so for resting heart rate – for example – you get a seven day average when you tap for more. For sports, you press the right-hand button at the bottom of the watch, and the list appears. The full list includes: Run, bike, pool swim, golf, walk, row, SUP (paddle board) ski, XC ski, run indoor, bike indoor, walk indoor and row indoor. It's an incredible list – and there's a surprising amount of data involved in each mode. You get pace, distance, HR and cadence for running, but also ascent for skiing, distance for indoor running. Very few of the modes are just standard stopwatches. 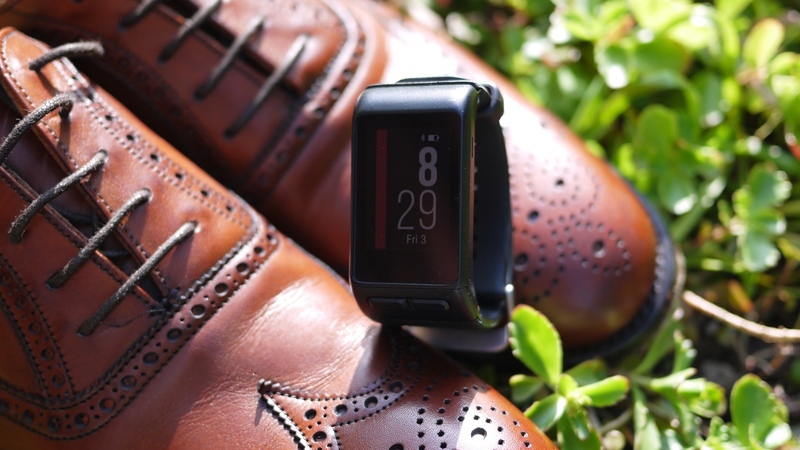 Aside than sports tracking there's also a host of smart functionality, with the watch able to show notifications from your smartphone, as well as some limited connected features such as weather forecasts on the wrist. We'll get through testing as many of the different modes as possible in due course, but for the purpose of this review, we're sticking to running, swimming and golf. Most of the other modes ape these features, and those modes are most important in terms of making comparisons and testing accuracy. When running, tracking is a fairly standard affair: you get pace, cadence, heart rate and the obvious pace/distance data. It falls short of a dedicated Forerunner by neglecting to add more advanced details such as VO2 Max or recovery details, but for most runners, it's a decent set of metrics. Of course, the big addition here is heart rate, delivered thanks to the Elevate (Garmin's own tech) sensor under the watch. It's a standard optical sensor that looks for the blood pulsing under your skin, and just like the scores of devices out there that promise the same, it does a fairly decent job. Out on longer runs it kept within 2bpm of a chest strap, making it a perfectly acceptable indicator of how hard we worked. Throughout a steady run, which did involve a fair amount of hill work, the Garmin lasered onto the chest strap with impressive accuracy. We use Strava to track our runs, which Garmin syncs with, and the heart rate data unlocks all manner of new features, which just makes the whole experience more detailed. In short, heart rate is great. But as we've proved, optical is a long way from being ECG on the wrist. The tech is prone to totally breaking down at high intensity and the Vivoactive HR is no different. Just compare the two graphs below of a short interval session versus a chest strap, which show the smooth curves of the strap versus the freaking out optical. While it was flawless during steady exercise, as we added bursts of activity to our workout and our heart rate soared to 190 the Vivoactive stalled at around 165. It seemed paralysed there and when we returned to rest and the chest strap detected heart rate falling back to 150, the Vivoactive still lagged behind. In short: it's great for general running, but if you want to start tracking intervals, you'll need to invest in a chest strap to pair with the Vivoactive. Garmin watches have been cleaning up in our swimming tests too, and the Vivoactive HR features all the same modes that ensured the original Vivoactive aced our pool review just two months ago. It'll track lengths, distance, pace, stroke count/rate, calories – and it's one of the most reliable devices out there. For cyclists, you'll get standard GPS data on speed and distance, but the Vivoactive will pair with Garmin's range of bike sensors, so serious cyclists are catered for. A Garmin golf watch will easily set you back around £200/$200, so having the feature baked into a standard sports watch is a big draw for weekend hackers. We tested it out on the course, and as you'd expect from Garmin, it works well. You get distances to the front, back and middle – and you can call up a map of the green and check lay-up distances too. A live score card is also available as well. The only real bugbear is that unlike on dedicated golf watches, you have to download the course data on your phone before you play, and then pair the two devices in order to start. It's a bit of a fiddly process, and prone to breaking down. We ended up trying to sort it out while walking down the first fairway, which isn't ideal. Of course, you don't get the whizz-bang features of the new Approach S2 or Approach X40. There's no automatic shot detection (which doesn't work properly anyway) and it doesn't sync up with the TruSwing. But for runners/cyclists who golf, it's a good mix of features, even if there's a pay off in usability. Like its predecessor, the Vivoactive HR is waterproof to 5ATM (up to 50 metres) and it's already equipped with a dedicated swim tracking mode. There's no open water option like you get on more expensive Garmin watches like the Fenix 3. This is built for jumping in your local pool only. Getting up and running is as straightforward as tracking a run or a bike ride. Hit the right physical button below the screen and tap on the Pool Swim tracking mode. For first time swimmers, it'll let you select the pool size (25/50m) including a custom size option and it'll set this to default the next time you jump in the pool. The screen inverts giving you data fields for interval time, interval distance, total time and distance. The optical heart rate monitor is disabled as it's not much use in the water. It's the same story with the touchscreen, although you can use the physical buttons to mark lap intervals. We put it up against the TomTom Spark's swim tracker mode, which we've found reliable for accuracy in the pool. There was some noticeable differences in distance recorded with a 1o stroke difference for average stroke rates. What you do get with the Vivoactive HR is a pretty respectable collection of metrics including pace, speed and moving time indicating when you've taken breaks within the session. There's also graphs breaking down pace, strokes and your SWOLF score. Even if swimming is not your primary reason for using the Vivoactive HR, there's plenty of data to tap into and it's a solid performer in the water. Garmin has really nailed activity tracking, and it's become a big feature of its current line-up of specialist sports watches. In terms of detail and accuracy, it's probably one of the best activity trackers on the market. Steps are recorded and movable goals are automatically calculated, so the longer you use it for, the smarter (and more difficult) your goals will be. As well as step tracking it will also keep tabs on your active minutes and the move bar is a neat way of alerting you to sedentary habits, if you feel like you need a kickstart to get away from your desk. As the move bar fills, you'll need to get out of your chair to clear it. However, it's the way Garmin treats heart rate that's the real triumph. As we bleat on about endlessly at Wareable, resting heart rate is one of the key metrics for monitoring your fitness. As it gets lower you are getting fitter. This is a key screen on the Vivoactive HR. What's more, you can tap in further to see it plotted over the last week. Checking your resting heart rate daily is a good way to look for issues with your health or detect over training too, and we love this element of the Vivoactive. You can go further in the app as well. Head to the menu and choose Health Stats > All Day Heart Rate and you can look at charts of resting heart rate over a seven day or four week period. The only issue – as we've found with the Fitbit Blaze – is that building reliable data can be challenging. On the whole the Vivosmart is accurate but unless you wear the device all day, it's not going to find those all-time low bpms. With one day off it can really throw the data, leading to some messy graphs. The sleep tracking features of the Garmin are a little underwhelming too. The Vivoactive will automatically track sleep, and always frames the data within your usual bedtime hours. We guess that's to show you how often you go to bed on time, but life doesn't really work that way. There's a lack of aggregated data as well and there's little to see in terms of sleep trends. You can dive into any night's sleep from the last seven days in the app, but we often found a data was a bit off, showing no deep sleep or light sleep. Basically, if you're into sleep, the Garmin isn't the best. The last part of the Vivoactive HR's feature line-up is its ability to connect to your smartphone to deliver notifications and information. The obvious application is for notifications, and the Vivoactive HR will display any message that appears on your phone. While this does mean it can be a little noisy, we prefer it to the slim list of compatible apps sported by the Fitbit Blaze. You can read short messages, but longer missives will be snipped off, and you can recall them by sliding down to the notifications option on the main screen. The real triumph of these notifications is the simplicity. You get a call, message, Facebook update or tweet and the watch tells you about it. After it's dismissed it goes away, and there's no interaction required. It works 100% of the time, without any fuss. It's not just calls and messages either. As you slide down the list of options on the Vivoactive HR's screen, you can see weather forecasts, with enhanced views for hourly and weekly outlooks. It's a really nice touch and certainly makes the watch feel more useful every day. The Garmin Vivoactive HR uses Garmin Connect, which is available for iOS and Android. It also has a web element, which is much more feature rich, which you can access via connect.garmin.com. It's a decent platform, albeit quite confusing when you're using daily activity tracking features. The first thing you're presented with is a bunch of segments, which you have to slide through to see your activities. From there you can dive into runs, cycles, workouts, or just your daily activity data. The thing to take away is that the Garmin Connect mobile app is very complete and all your data is in there – somewhere. Even we're still constantly learning things about the app. It's not challenging Fitbit for simplicity, but it's one of the most complete evaluations of your fitness around. Things do look up via the web app. The web boasts tools for building custom workouts, designing and discovering routes and reviewing data. Also, it's possibly the most complete multisport ecosystem, with running and cycling placed alongside golf, which is missing in any meaningful way from the mobile app. Don't forget, Garmin allows you to spit out data to Strava, which happens to be our preferred platform. That means you can just run or cycle with your watch, sync it up when you get back and enjoy all the segments and personal records for your routes as normal. Garmin is a bit of an unsung hero when it comes to battery life, and the Vivoactive HR is another winner. You'll get around five days of battery life using all the features and a good dose of GPS. Garmin puts GPS tracking at around 16 hours, which we'd agree with. That means that multiple rounds of golf, long weekend walks and ultra runs are all within its remit. The Vivoactive HR will do a lot with very little battery too, and we went out and got decent runs under our belt when the battery level actually looked dangerously low. Of course, the low-res, low brightness screen is the chief reason it's able to boast such impressive longevity. However, it's yet another great battery triumph for Garmin. Just the breadth of features and the confidence from Garmin to put the essence of all its huge line-up of devices into one, jack-of-all-trades sports watch makes this device a stunner. If, like us, you're a sports enthusiast who isn't obsessive over the details of just one type of activity, it's truly the watch for you. Great notifications and rich data from the HR sensor complete a top performance, and the daily activity tracking is top notch too. The only downside is the design. Yet again from Garmin, it's not a device that inspires daily wear. For many this will undermine the daily features, but if you spend your weekends and holidays running, walking, cycling, golfing and skiing, this is the only watch you need to buy.